As the equity markets continue to new highs, I'm reminded of Do Something Syndrome and the dangers of impatience. When your stocks are working, and charts are going up and to the right, why are you so compelled to mess it up? It's the same reason why you spend way too much time addressing unimportant e-mails. Taking action, even if it's relatively meaningless action, makes us feel like we're making progress. As investors, we often feel that "investing" implies taking action. You need to buy something, or sell something, or check your cellphone for the market update. Doing nothing, and waiting for actionable signals that really compel you to take action, is often in your own best interest. Trading for the sake of trading alone has rarely, if ever, led to long-term success in the markets. Or as Shane Parrish summarized, "Don't confuse activity and results." Indeed, there is a reason why investor performance is usually measured by the size of returns and not by the number of trades! So what should compel you to take action? For me, it's always about price and a clear indication of a change. DISH Network Corp (DISH) is a perfect illustration of a rotation from accumulation to distribution which provided a series of red flags. For most of this chart, we see DISH making higher highs and higher lows, a straightforward Dow Theory uptrend. The price breaks down through the purple trend line using the Sep 2016 and April 2017 lows. The price breaks down through the green 200-day moving average. The price breaks down through the yellow support level using the Jan 2017 and April 2017 lows. The orange 50-day moving average crosses down through the green 200-day moving average. In my opinion, #3 above is the most meaningful signal. This means a Dow Theory downtrend of lower lows and lower highs, and suggests that buyers that previously found DISH a good value in the $57 range are no longer interested. #4 above is the least meaningful signal. I've found the hit rate on moving averages crossovers to be fairly mediocre. I'm including it here because it's often the very last signal to be triggered. Sort of a "line in the sand" if you will. So what now? I'm a trend follower by nature, but I always look for indications of potential inflection points. 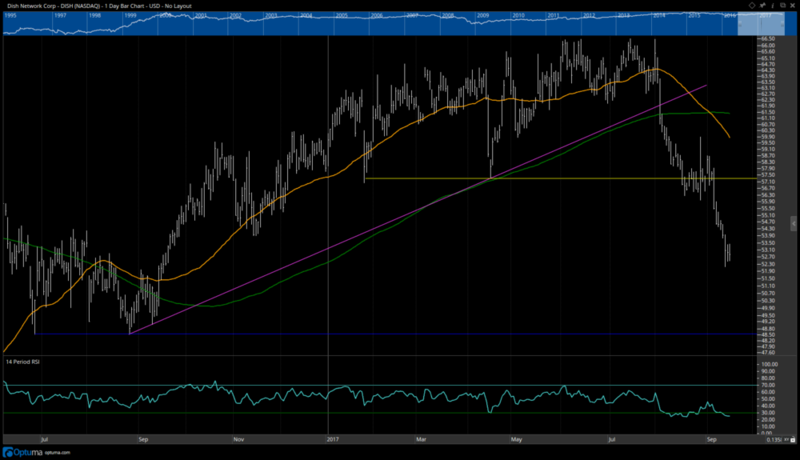 It will be interesting to see what DISH does if it makes it to previous support around $48.50. I'm also watching the RSI, not for when it's oversold but more for when a rally pushes it back above 50 or so. RSI can stay oversold for much longer than you'd think, as Equifax (EFX) would tell you. In terms of a more long-term reversal? I'm looking for essentially the opposite of the list of red flags. Price breaking above a trend line using recent highs. Price breaking up through the 200-day moving average. Price breaking above a key resistance level. For now, I'm very happy doing nothing. Disclaimer: This blog is for educational purposes only, and should not be construed as financial advice. At the time of publication, the author has no position in stocks mentioned in this article. Please see the Disclaimer page for full details.